A true story about a missing alpaca and his blind brother, Bambi, who suddenly had to fend for himself without his lifelong companion and paddock-mate, Charisma, to lead him around. Bambi frets with only sheep for company, and refuses to eat. Can a new alpaca best friend be found... read full description below. 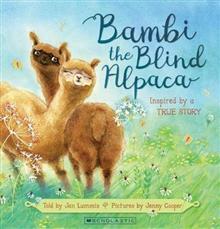 "A story about a missing alpaca and his blind brother, Bambi, who suddenly had to fend for himself without his life-long companion and paddock-mate, Charisma, to lead him around. Bambi frets with only sheep for company, and refuses to eat. Can a new alpaca best friend be found?" --Publisher information.